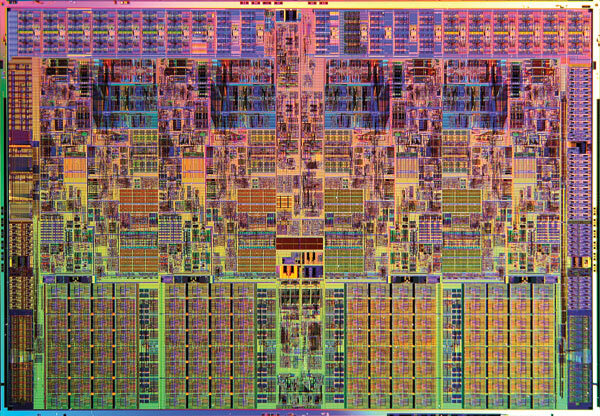 The Technology Review magazine has an arresting photo essay on Moore’s Law — as told through a bunch of stunning pictures of computer chips. Click on the link above to see all the other circuits. 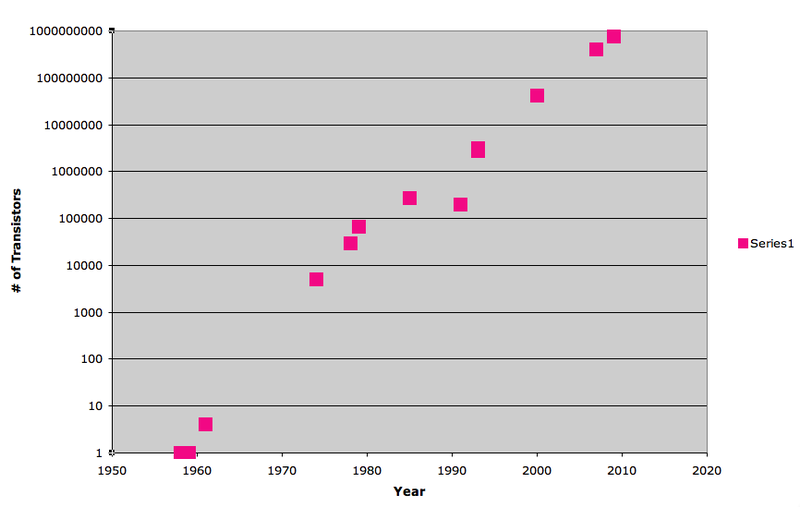 For those who don’t know, Moore’s Law says that about every two years (some say 18 months), the number of transistors that can fit on a circuit doubles (for Wikipedia article, click here). 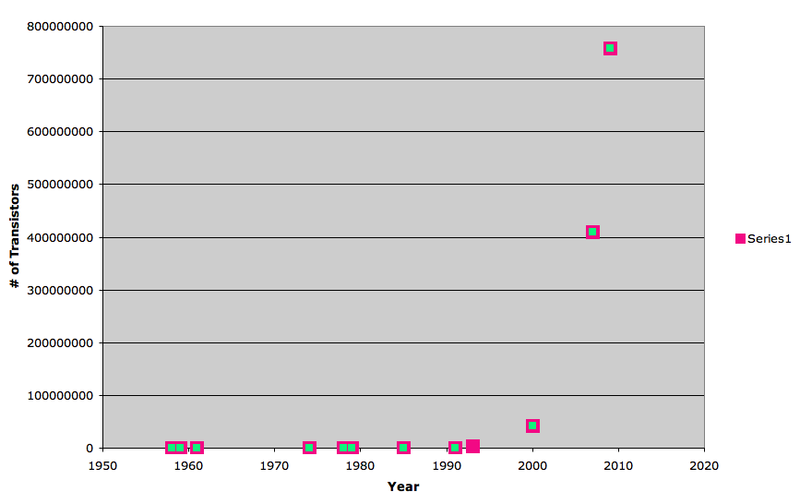 So of course, even though this data isn’t perfect nor complete, I thought I’d see how it’d look graphed. Ohhh, this looks pretty linear! I wasn’t sure that it was going to work out. The exponential line of best fit is: . 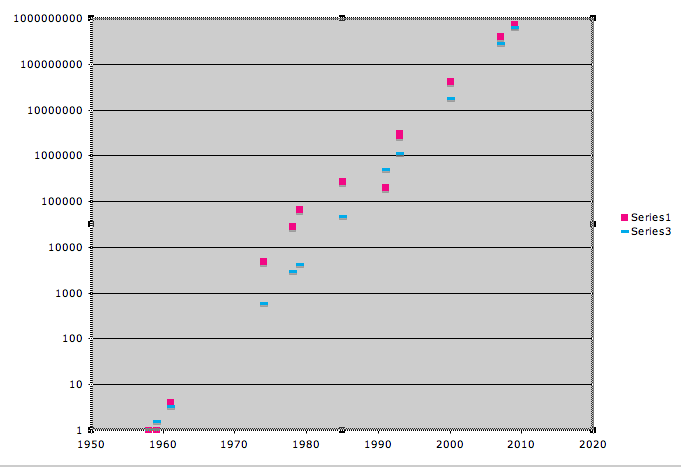 When I plot the data (pink) and the exponential line of best fit (blue) on the log-scale graph, you’ll see that Moore’s Law looks like it has some serious bite to it. Doing a little algebra with the exponential model we came up with, it appears that the number of transitors doubles about every 1.75 years. I’m going to be teaching exponential functions in a bit. I hope we’ll have time to do regressions. If so, I’ll probably make a 2-day investigation out of Moore’s Law. I haven’t done the work, but when do we reach physical constraints (ie, width of a molecule or two)? @jonathan: I’m not sure… But looking at that picture, it seems like a great question to ask! The article I read — and this could be wrong — says that the constraint at the moment doesn’t seem to be the ability to increase the # of transistors, but how to effectively power them (so that the silicon doesn’t melt). The article was saying that one option for companies like Intel is to create multiple chips that work in parallel (multiple cores, I think they called it), because currently the chips are designed to work linearly. However programming in parallel is tough, because we tend to need step 1 done in order to do step 2 (add these two numbers, then multiply the result by 2).